Today the King of the collection takes his throne. 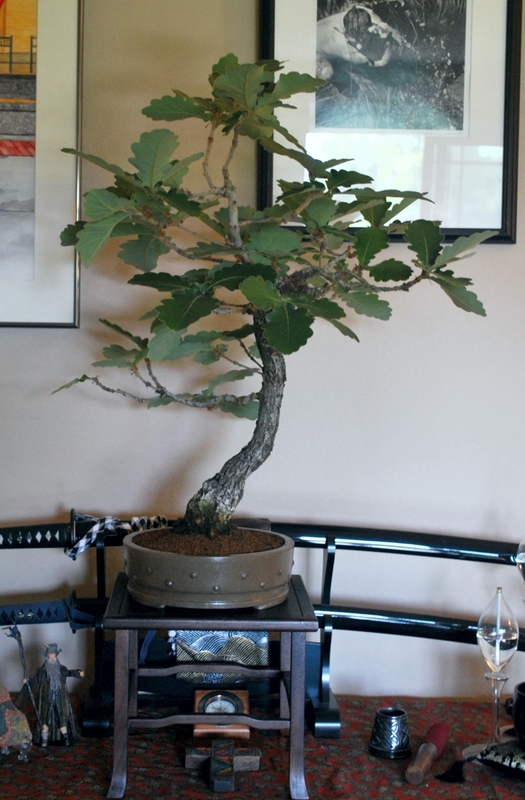 I have been getting the Daimyo Oak ready for show at Filoli Estate and Garden Flower Show. The show will take place on June 3-4 at Filoli located in Redwood City. Be sure to check out the club mini-show to be held there in honor of the event. As for the oak, I see changes I need to make on it. It is a never ending process of refinement. At the top I have a branch that needs shaped and wired lower and I will get to that after this mini-show and before the main club show. A few other minor refinements to make it good to for this year. Quercus dentata, also called Korean oak, Japanese emperor oak, also daimyo oak (Japanese: カシワ or 柏, kashiwa; simplified Chinese: 柞栎; traditional Chinese: 柞櫟; pinyin: zuòlì; Korean: 떡갈나무, tteokgalnamu) is a species of oak native to Japan, Korea and China. The name of the tree is often translated as “sweet oak” in English to distinguish it from Western varieties. Quercus dentata is a deciduous tree growing up to 20–25 m tall, with a trunk up to 1 m diameter. Its foliage is remarkable for its size, among the largest of all oaks, consisting of a short hairy petiole, 1–1.5 cm long, and a blade 10–40 cm long and 15–30 cm broad, with a shallowly lobed margin; the form is reminiscent of an enormous pedunculate oak leaf. The leaves are often retained dead on the tree into winter. Both sides of the leaf are initially downy with the upper surface becoming smooth. The flowers are produced in May; the male flowers are pendulous catkins. The female flowers are sessile, growing near the tips of new shoots, producing acorns 1.2–2.3 cm long and 1.2–1.5 cm broad, in broad, bushy-scaled cups; the acorns mature in September to October.